In the last five years, the e-cigarette, or vapor, industry has exploded in popularity as an increasing number of consumers embrace no-smoke tobacco products. New vape shops are opening across the country, and many are exceeding their business growth projections within a matter of months. With success has come a host of challenges for many vape business owners who are finding it difficult to keep up with customer demand and to effectively manage their increasingly complex financial needs. 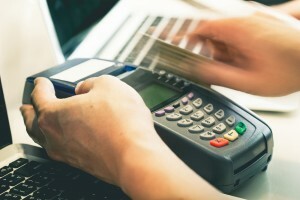 Along with obtaining enough working capital to sustain continued growth, vape businesses also require reliable merchant account services for managing their credit card processing needs. Because vape businesses are considered high risk due to their higher than average rate of chargebacks, many find it difficult to obtain quality merchant account services. And, some vape companies even choose merchant account processing service providers that specialize in high risk industries, despite the fact that they have higher fees and typically more complicated set-up processes. In the case of Vapejoose, a rapidly growing e-cigarette business based in Newport Beach, California, a high risk merchant provider unexpectedly froze their funds and cancelled their account. The business found themselves in the position of scrambling to find an alternative merchant provider to get their successful business back online. In their quest to find an alternative solution for managing their credit card processing, they happened to stumble upon BankCard USA, who was vendor at an annual vape convention. In less than one day, Vapejoose was able to get back to selling their vape products both wholesale and retail online, and they were able to avoid missing a busy weekend of sales. While BankCard USA offered immediate assistance to VapeJoose, their services have also proven to provide long-term savings. In fact, the growing business was able to save more than $30,000 by offering lower processing rates, lower transaction fees, and faster funding than the previous processor. VapeJoose also found that their new credit card processor was dedicated to supporting their business with personalized attention and leading-edge solutions. As a growing business that relies heavily on merchant account services, VapeJoose is delighted to have a partner like BankCard USA that is truly dedicated to their success. Want to find out more about how VapeJoose was able to save tens of thousands by switching to BankCard USA for their credit card processing? Watch this video.